They didn’t set out to be heroes (well, except for maybe Fred). Certainly, after handling the mess with Callaghan, Hiro Hamada and his friends were more than ready to put away their super suits and dive into the challenges that “nerd school” presents them, especially with an intimidatingly impressive new dean at the school. But it seems there’s a new villain in San Fransokyo, and the Big Hero 6 team is needed. So Hiro, Wasabi, Honey Lemon, Go Go, Fred, and Baymax don their secret identities and work hard (and smart) to protect their city–while also facing the challenges of being students at a highly advanced university. Good thing they’ve got each other to rely on. Big Hero 6 is one of my favorite movies, period, and it’s grown on me with each time I’ve watched it (several times at this point). Big Hero 6: The Series picks up where the movie left off, although it retcons the ending just a smidge to make it work better as a series. I really love that Disney chose to take this tack with the story as opposed to doing another movie; it works so much better for this particular story. All the things that I love from the movie are here–the amazing characters, the neat art style, the great blend of action and humor, and the emphasis on character and doing what’s right. But because of its being a series, it’s allowed to be its own thing and develop in its own way as well. For instance, the art maintains the lines and general style of the movie, but rather than being the CGI style of the movie, it’s more of a traditional 2D animation–it manages to be soft, detailed, and very attractive while still lending itself to the action and comedy elements well. This is a smart show in that the characters are smart and there’s a lot of science thrown in, but it’s certainly not a hard-science story; you’ve got villains who completely defy all known science, for instance, and even the science that’s used is always secondary to the story. And the storytelling and characterizations are where this series truly shines. You’ve got the same brilliant, lovable characters that we were introduced to in the movie, but here they’re allowed more time to be developed gradually in more different circumstances; they truly shine, and I love them. The stories themselves tend to be episodic while tying in to a bigger plot that gradually unfolds (I do recommend watching in order), with some episodes being more focused on handling villains and others dealing more with normal everyday life–school, friendships, making good choices, that sort of thing. Usually, there’s a good mix of both, though, with enough humor to make me laugh aloud at least once per episode. As far as the intended audience, well, I enjoy it as an adult, but it’s rated TV-Y7, I believe, and I would feel completely comfortable letting my 4-year-old niece watch it. There’s some superhero action/violence, but they keep it pretty safe on the whole; no blood or anything like that. Definitely recommended, especially if you enjoyed the movie. Three teenagers find themselves waking up together in a doorless room with no memory of who they are or what their lives were like before that moment. An old typewriter on the floor and names written on pieces of paper in their pockets are their only clues–Adam, Mira, Kai. Accepting that these are their own names and that playing along with whatever “game” or “puzzle” is afoot is their only way to escape, the three begin working together, putting their skills to work in the series of ever-stranger situations they find themselves in. And they’ve got some pretty crazy skills to put to work, too! Which makes them have to wonder, who on earth are they? Because normal people can’t do the things they can do, and they’re freaking themselves out. The Hollow is a show that I actually watched on recommendation from some family members, and while it’s not exactly what I would normally watch, I did enjoy it. But I feel like I can’t properly review it without totally spoiling it, and it’s one of those shows that you do not want to go into with spoilers. The mystery and watching it unfold is a huge part of the enjoyment of this story. And yes, mystery there is aplenty. The what-on-earth-is-going-on factor is on a level that nearly surpasses that of Dirk Gently’s Holistic Detective Agency, and that’s saying something. It’s such a strange mix of genres and themes that I never really felt like I knew what was going on, right up until the end where everything’s explained. It did kind of feel like some of those kids’ stories where each character has specific skills that are suited to specific tasks and everyone fits just so; I didn’t care for that so much, it’s just not my thing, but it does make more sense once you get the explanations. The characters were good, not great, but good. Normal, if you can consider teenagers with superpowers to be normal. They’re relatable, which given the situation they’re in and how you’re supposed to be getting into that, is what you really want. The art is interesting; an animation style somewhere between an American cartoon and, say, A Cat in Paris, at least in terms of the character design. I think the character designs felt a bit inconsistent between characters, like the styles switched somewhere in between them, but it worked in this context. Overall, for those who enjoy having their head messed with and watching an inexplicable mystery unfold, I would recommend The Hollow. Two brothers, Sam and Dean Winchester, travel the country in the 1967 Impala that is more home to them than any building has ever had the chance to be. They start out searching for their father who has disappeared while hunting the demon that killed their mother years ago. Along the way, Sam and Dean hunt as well–fighting monsters, ghosts, demons, the stuff of nightmares, and saving people from horrors they can’t even imagine. Sometimes their efforts go utterly unnoticed; other times, they meet incredible people who help them on their journey. Regardless, they always have each other, except for those rare, horrible times when they just don’t. And somewhere along the line, hunting simply becomes who they are–it’s no longer just a revenge mission or a search for their father. Sam and Dean are, quite simply, hunters; they save people, they save the world. A lot. I’ve put off reviewing Supernatural for, like, 2 years now because I love it so very much, and I know I can never do it justice in a review. So know that first, before I delve into details; this show has my heart in a crazy way that almost no other story ever has, and it has continued to consistently for years now. I couldn’t say exactly what makes this show so incredible, largely because it’s a lot of little, subtle things combined. I love the characters, first and foremost. Jensen and Jared do such an amazing job of getting in their characters’ heads and of portraying them deeply and transparently, as do the immense number of wonderful guest cast members. So much so that, although this is at times a monster-of-the-week kind of show (much less so as you get to later seasons), it manages to be highly character driven. The characters grow and experience a lot of internal conflict over the course of the series as well, which is another thing I love–the show evolves as it goes, so that just when you think they’ve done it all (I mean seriously, we hit the biblical apocalypse in season 5) you find yourself seeing things afresh, finding new frontiers. And the writers do such a great job keeping the balance between all the angst (and yes, here there be angst) with family support and outright humor (e.g., recently in the midst of this big series of episodes focusing on busting into an alternate dimension to save family members–lots of angst and tension–we get a random crossover with Scooby Do that, while darker than typical for the cartoon, is brimming with laughs and fun as well). I guess what I’m trying to say is that Supernatural somehow manages to be a lot more than hot guys fighting scary monsters and saving the world, although yes, it’s definitely that. It’s family and understanding and acceptance and so many things that I long to see more of, and I highly recommend this show. “Have you noticed an acceleration of strangeness in your life of late?” It’s an odd question to be coming from the man who just forced his way through the window into your flat then had the audacity to be affronted when you’re upset by his presence. And yet, for Todd Brotzman, it’s an oddly apt one as his life has abruptly gone from one of inane consistency to a flurry of strangeness, ending with himself unemployed, a person of interest in a frankly impossible murder case, and, oh yeah, with an odd man in a yellow jacket climbing through his window. And the fun is just beginning. Dirk Gently’s Holistic Detective Agency is one of those shows that is absolutely brilliant . . . as long as you have the patience to deal with the utter absurdity of it. The WTF-factor is huge here, with weird happenings and an accumulation of strange coincidences that all happen to connect somehow just piling on en masse. But the story has a way of rewarding viewers who stick around for the weirdness, bringing everything together in the end to make an odd sort of sense. The characters are well written, brilliantly cast, and quite interesting. Moreover, they’re relatable, perhaps more than most any characters in a TV show I’ve ever encountered. Seriously, they’re so utterly not pulled together, and it’s actually endearing and affirming to see them going about their lives, trying to make things work, while sometimes not having a clue and being so ridden with doubt and guilt. They’re very human in the midst of something that’s completely strange, paranormal even. Which isn’t to say that all the characters are normal–I would say that Dirk himself, as well as all the other Black Wing subjects, are extremely odd in their mannerisms and their way of interacting with the world, the whole “holistic” leaf-on-the-wind thing. But they make for fabulous characters. I feel like the filming is visually rewarding as well–case in point the very beginning of the first season, where we go from close-ups of Dirk’s face (too close to actually identify him immediately) to an impossibly violent and improbably crime scene to a kitten in rapid progression. Or the beginning of the second season, where we are confronted with a fantasy setting, complete with a pink-haired prince and giant scissors wielded as swords (I was almost convinced this was a preview for another show at first, it was so strange!). Seriously, though, Dirk Gently’s Holistic Detective Agency is one of those shows that definitely isn’t for everyone, but if you’re willing to be patient with the weirdness, it’s oddly rewarding. In present-day Paris, Marinette deals with the same things most students do–friends, schoolwork, crushing on the cutest boy in the school. Not that Adrien seems to even notice her particularly, although it would help if she could actually talk to him without tripping all over herself and looking like an idiot. 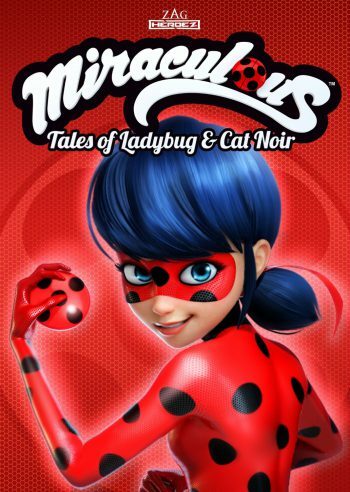 But that’s not all she deals with, because you see, Marinette has a secret alter-ego–the superhero Ladybug, sworn protector of Paris along with her partner Cat Noir. Miraculous Ladybug was a fun, unexpected find for me, something I’ve heard other people mention but didn’t have high expectations for myself. It’s a French kids’ CGI adventure show, and it’s pretty random for something like that to even cross the radar in the States anyhow. Not surprising, though, considering that this show is actually quite good. It pulls from a lot of different sources, giving it a unique flavor–kind of a mix of mahou shojou and your more traditional superhero stories, but also a cute slice-of-life story. The CG can feel a bit stilted at times, but overall the animation is excellent if not my ideal style; it still has some cute anime influences, which is fun. This story is solidly a kids’ show. It’s clean–astonishingly so, in fact. It has the repetition, the set episode pattern, to make it ideal for a younger audience (although that very thing may get kind of annoying for older viewers). By the end of each episode, everything is cleaned up and put back right, and the city views Ladybug and Cat Noir as proper heroes. Moreover, the show teaches important life lessons like responsibility, honesty, and courage. All of which make this an excellent show for children, but there is actually something there for older viewers, too. Because behind the masks and the cheesy villains and all, you’ve got some awesome characters who show growth over time. You’ve got diversity. You’ve got an adorable slow-burn romance. You’ve got real, developed friendships and Marinette has an awesome, supportive family. So there’s more than meets the eye in this cute kids’ show. I’m looking forward to seeing where Miraculous Ladybug goes in the future (I’ve only seen season 1 so far), although I’m dying for some development and a reveal between Adrien and Marinette. We’ll see if/when that ever comes.